Certain dogs are potentially dangerous as defined by the law in California. Some dogs by Authorities deem a dog vicious. Some progress from one label to the other. When it comes to dog bite attacks and dog bite laws, these terms are not merely adjectives – they are legal statuses that matter quite a bit when it comes to how they are handled and how they are allowed to interact with the public in general. Unfortunately, these labels are only used when people are harmed by dogs. The California dog bite lawyers at the Dog Bite Law Group have helped many people who have been injured in dog bite attacks assert and properly enforce their legal rights. We do so out of a sense of duty, as we hope we can help minimize dog bite attacks. We believe issues such as legal statuses placed on dogs because of attacks that have occurred are important for people to understand. Below you’ll find an overview of the laws dealing with these situations, what they mean and how they can affect you. If you’ve been injured in an attack, contact the Dog Bite Law Group today to schedule a free initial consultation. Potentially dangerous dog – A potentially dangerous dog is one that, within the previous 36 months, has on at least two occasions behaved in a way that forced defensive action by a person to prevent bodily injury. This behavior needs to have occurred off of the property of the dog’s owner. A potentially dangerous dog is also one that has bitten a person within the previous 36 months causing an injury. Finally, a potentially dangerous dog is one that has killed or injured at least two domestic animals off of the owner’s property. Vicious dog – A vicious dog is any dog that, without being provoked, severely injures or kills a human being. A dog can be classified as vicious if, after its owner is notified that the dog has been classified as potentially dangerous, continues the behavior that earned the first classification. Enclosure – An enclosure is relevant to dogs that are entered on the dangerous dogs list because it is required that the owners of these dogs have a structure that is sufficient to keep children out of the area and to keep the dog from escaping that area. Keeping and controlling potentially dangerous dogs – Generally speaking, a potentially dangerous dog must be kept on the property either inside the home or within an enclosure as described above. If the potentially dangerous dog is off the property, it must be kept on a “substantial” leash of appropriate length and be under the control of a responsible adult. You can find the full text of the California statutory language here. Remedies – The most obvious difference between a potentially dangerous dog and a vicious dog involves the ultimate remedy for a dog bite attack situation. Specifically, a vicious dog may be destroyed by the county while a potentially dangerous dog does not face that potential result. Additional ownership – If a dog is found to be vicious, the owner of that vicious dog will not be allowed to own, control or otherwise have custody of another dog for a period of up to three years when it’s found that owning another dog would lead to a significant threat to public health, safety, and welfare. Potential removal from the dangerous dogs list – A potentially dangerous dog can and will likely be removed from the county’s list of dangerous dogs if it does not exhibit any additional behavior that got it onto the list in the first place for a period of 36 months. No such provision exists for vicious dogs that are not destroyed. It is also worth understanding what these designations mean to people who are injured in California dog bite attacks and who pursue a recovery of damages in civil court. California is what is known as a “strict liability” state, which means that if a dog injures a person and no defense applies such as provocation or trespass, then the owner of that dog is generally liable for damages. Specifically, it means that a dog’s placement on a dangerous dogs list is not altogether relevant in terms of whether or not that dog’s owner should be liable for those damages. It is relevant, however, with regards to what ultimately happens to that dog and perhaps to that dog owner in the criminal justice system. Owners of dangerous dogs that are not properly cared for or restricted from access to the public can face significant criminal penalties, including felony charges if a dangerous dog seriously injures or kills someone. If authorities deem a dog vicious, these legal designations and administrative processes are just another thing that you may wind up feeling as though you have to handle. 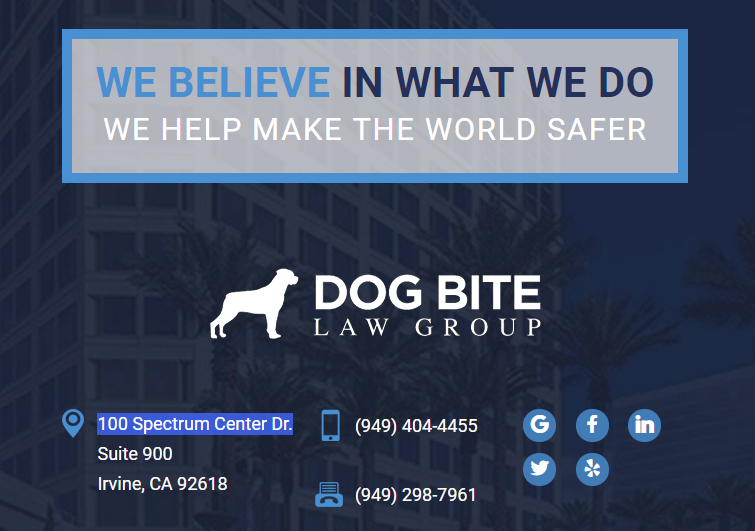 Rather than working through all of this alone, seek the help of an Irvine dog bite attorney who has been fighting for the rights of the injured for years. Contact the Dog Bite Law Group today to schedule a free consultation.